It is often hard to encourage employees or colleagues, so here are a few handy suggestions to encourage your workmates to recycle. Make it clear which bins are for recycling and which are for general waste and soon enough people will know what to put in which bin without having to stop and think. You can download and print bin stickers, for extra clarity, on the Recycle Now Partners Website. If you have wastepaper baskets dotted all around the office which are used for general waste, replace these with recycling bins, with just one general bin in the centre of the office. If people have to walk to throw away rubbish they will consider whether they can recycle it as it’s nearer and easier to do. An enthusiastic volunteer can make the difference between people bothering to recycle and not. Having someone approachable who knows what is and isn’t recyclable can also help people who are unsure about whether to put an item in the recycling or the general waste. A quick mention in a meeting or the odd (sparing) email to reinforce the importance of recycling can help to keep people on track, keeping recycling uppermost in their minds. 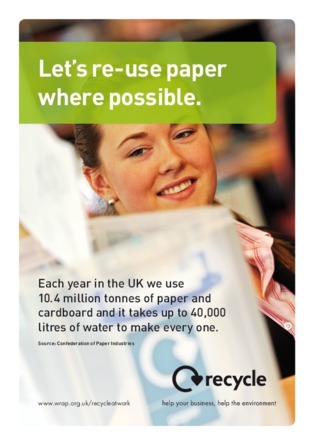 You might like to run a competition to find the best new recycling slogan; you might want to divide the office up into areas and see who can produce the least landfill waste; you could even run a recycled art competition to see who can make the best sculpture out of recyclables. A little bit of healthy competition is great, but the main thing is to make it fun, so as to engage your fellow staff members. A successful workplace recycling programme is not just great for reducing your office landfill – it also encourages people to think more about recycling. If you have some staff who still do not recycle at home, your efforts might even have an impact on them.